Backhoe loaders can be seen on just about every major construction site you encounter. However, while they may common, their background and features may not be so well known. In this Shop Talk Blog post, we are going to discuss some of the more interesting facts about the backhoe loader. Backhoe loaders go by several different names, including backhoe, digger, and loader backhoe. Strictly speaking, the term backhoe refers to the hydraulic arms and hinged bucket at the rear of the machine that are used to excavate material. It gets its name from the fact that it pulls the material toward the back of the loader, making it a backhoe (unlike a shovel, which digs away from the machine). Hoe refers to the fact that early designs for the shovel looked very similar to a farmer’s hoe. The loader part of the name, of course, comes from the front bucket that allows it to function like a standard bucket loader. Some historians insist that the birth of the backhoe loader dates back to 1835 at the implementation of the steam-powered dipper shovel (also known as a steam shovel). 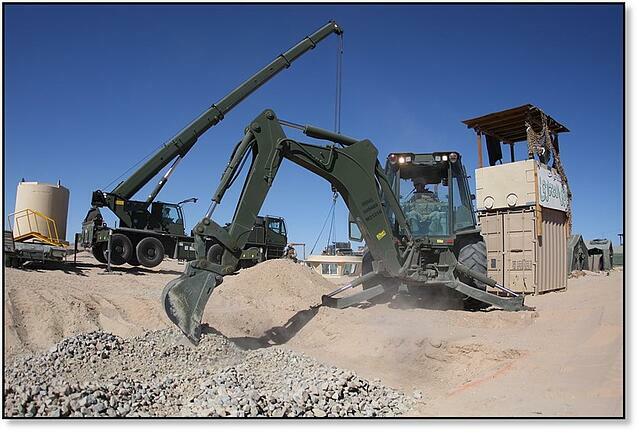 Unlike the modern backhoe that has four-wheel drive, the dipper shovel was transported via rails to its work site. The front-end loader as we know it today was first developed in the 1930s. The bucket itself was cable controlled, far different from the hydraulic controls used today. Hydraulics controls were developed early on, but the technology was not well adapted for use on construction equipment until after World War II. 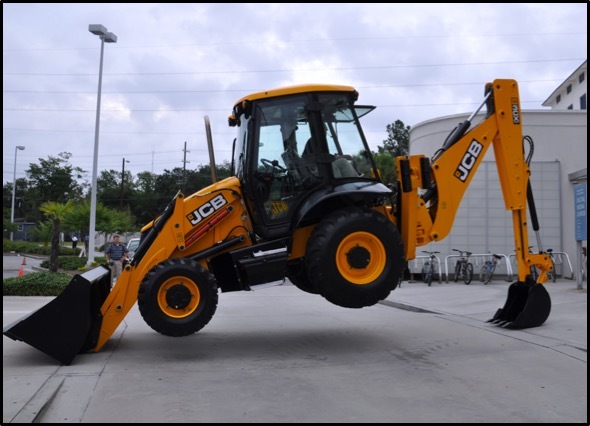 The backhoe itself evolved from a hydraulic-powered attachment designed for use on tractors. It was in the 1950s that the combined backhoe loader as we know it today was first popularized on construction sites. 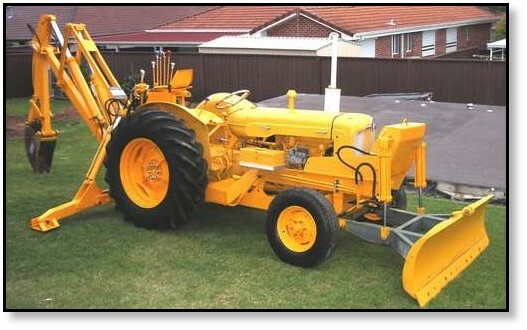 Note that the first backhoe loader was created by Whitlock Bros. in 1951 (shown in the image below), although JCB is usually assumed to be its creator. The first backhoe manufactured in the United States was made by CASE. The backhoe loader combines the useful features of both wheel loaders and excavators into one machine. Many backhoe loaders can often be transported under their own power to a construction site as opposed to being carried on a trailer. Backhoe loaders can travel about 25 mph on roads while excavators are limited to 3 to 5 mph. You’ll find backhoe loaders digging trenches, clearing out ditches, transporting materials, lifting loads, and breaking asphalt. They also work very well for digging below the level of the machine, usually at least 14 feet deep. Backhoe loaders can also be used for landscaping, digging holes, and demolition work. The bucket alone can be used for many different tasks, including dozing, spreading, leveling, loading, scraping, and lifting. However, there is also an ever-increasing variety of hydraulic attachments, both front and rear, available for backhoe loaders. This means that backhoes can be also be used for interesting tasks such as stump grinding, drilling with an auger, breaking up concrete, and more. Attachments for these machines include breakers, sweepers, forks, hydraulic thumbs, hammers, and tampers. The main market competitors for the backhoe loader would be compact excavators working alongside skid steer loaders or compact track loaders. Skid steer loaders have been able to remain competitive because of their versatility (enhanced through the use of hydraulic attachments), available power, and ability to travel on roads. If you're looking for a new machine, consider a backhoe for its power and efficiency!